For today's video we go over a little exercise to work that pinky finger and also show you how to move a major scale pattern across the fretboard. Thanks for stopping by, subscribe to stay inspired! A song from one of my favorite artists, Tommy Emmanuel's "The Mystery". Thanks to Corey Fujimoto for absolutely slaying it with his arrangement and thanks to all of you for watching! Today we talk about how to do a right handed mute or "chuck" to add a little percussive flair to your strumming. Today's sessions is a cover of one of my favorite songs by Deathcab for Cutie. I also worked a little chord/melody and some newer right hand percussive stuff that I've been trying to work into my playing. Thanks for stopping by and subscribe to stay inspired! Check it out! Today we talk about what happens when we transpose a major scale. Subscribe to stay inspired! Today we do a quick rendition of Hawaiian ukulele classic that a number of my students have been asking for help with, Guava Jam. Thanks for stopping by and be sure to subscribe to stay inspired! And the whole pattern repeats again at starting at A. We can familiarize ourselves with where certain notes are on the ukulele, or what I call fretboard geography, with this exercise. Play all the open notes and say each one aloud to yourself. We want to view these open strings as being our 0 fret. With a finger for each fret play each from 0 to 4 then back again. You can use this to warm up or practice your dexterity but at least once go very slowly and say the notes you are playing aloud to yourself. Give it a try and remember each of those in between notes has two names so the next time you do the exercise use its other name. Thanks again for all the support, if you found this or any of our resources helpful be sure to connect with us on social media in the sidebar and sign up for our email list under SUBSCRIBE in the sidebar to keep up with everything new at Ukulele Inspired. I want this to be interactive so don't be shy and send me some requests for the songbook and other content that you would like to see! Today we talk about a right hand technique I call the flick. A quick triplet that can be a strong lead in to the downbeat of the next measure. Check out Insight 2 for a little more about how rhythm functions on the ukulele. Want to learn to play the uke in a small group setting? Check out our 4-week beginners series focusing on the basics of playing the ukulele. The class size will be 6-8 people so go to https://squareup.com/market/ukulele-inspired to purchase and receive location details! Why: Cause it's gonna be fun! Today we discuss a little right hand technique on how to play triplets. Check out our Insight #2 about rhythm where we talk about how to subdivide beats within a measure in order to give us more ability to vary our strum patterns. We can create quarter notes, 1/8th notes, and 1/16th notes but we can also subdivide the beats into three different parts or into triplets to give a completely different feel to our rhythm. Thanks again for all of the support and be sure to check us out on social media, like and subscribe to keep up with everything new at Ukulele Inspired. I like to think of this chord as looking like stairs moving from the bottom and going up one fret and one string each time. Once I have the shape mapped out you can choose a pivot point on the chord, like the second fret on the A string. We can then move our pointer finger to that point first then build the stair shape from there. This can sometimes be easier than trying to find where all your fingers need to land in that chord. Lets take the chord G as another example. This is usually one of the first challenging transitions that we find when learning ukulele. We can map this chord as being a triangle shape with the point of the triangle pointing towards the bridge or to our right hand. The pivot point that I like to use for transitioning is again the second fret on the A string. If we can move our middle finger to this point and build the triangle around it can often be easier than trying to move all three fingers into the shape at one time. Remember when when we are learning new things we always want to simplify to give us the best chance at succeeding. Give it a try! Find some more difficult chords and trying mapping out the shapes with a pivot point that you can move to quickly and build the chord around it. Thanks again for all of the support and be sure to like and subscribe to keep up with everything new at Ukulele Inspired. 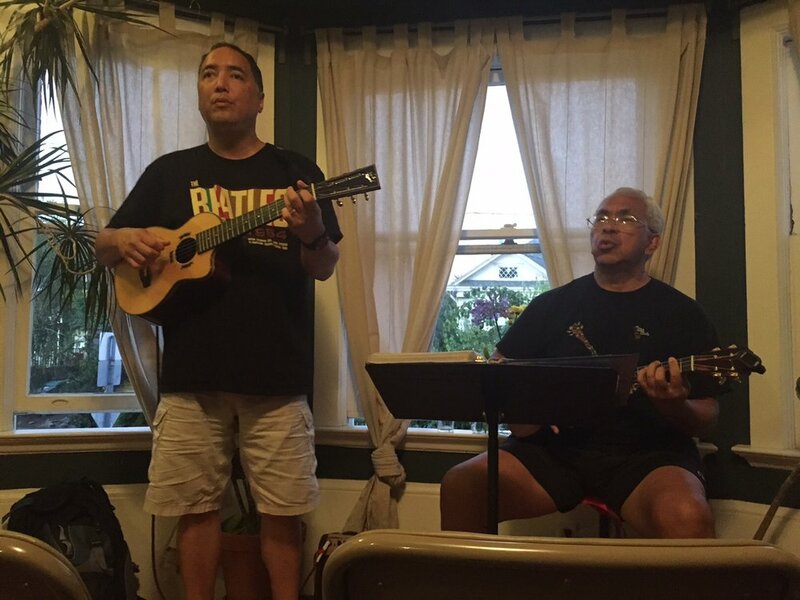 Want to learn to play the uke in a small group setting? Check out our 4-week beginners series focusing on the basics of playing the ukulele. The class size will be 6-8 people so go to https://squareup.com/market/ukulele-inspired and email me at ukuleleinspired@gmail.com for location details and to reserve your spot!